The date is obscured on this card's postmark, but it's generally in the range of a century old, with its green George Washington one-cent stamp. The "Made in U.S.A." card features young girls in red and blue outfits and a sled with a holly-adorned Christmas present aboard. A message of Christmas from me to you." Meanwhile, I also discovered, thanks to the power of Google, that this postcard is also being featured this year on what is basically the Swedish-language version of Papergreat (only much cooler). The blog is titled Gamla vykort, which translates roughly to Old Postcards. 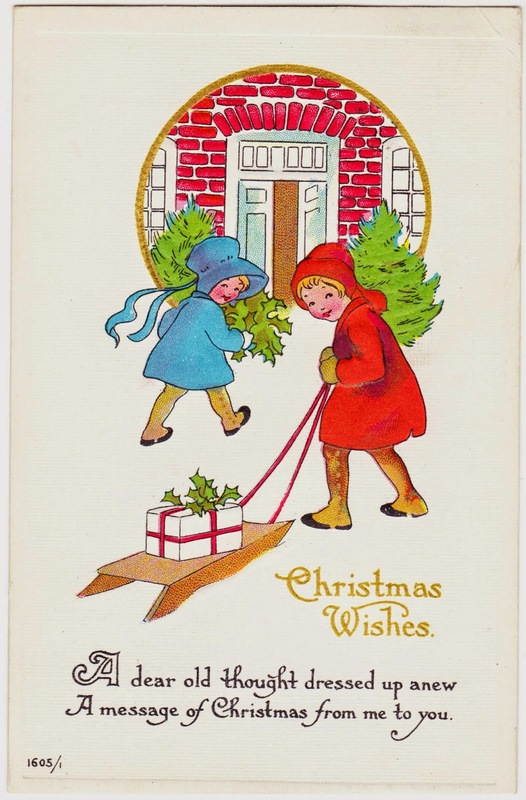 The September 30, 2014, post was titled "Julkort med vers (från Amerika och Kanada 1909-1929)," and it features this postcards and other wonderful vintage Christmas postcards from the United States and Canada. You should check it out. I also recommend the most recent post, titled "Flickan av snö - Snegorotjka."